Investors in marijuana stocks may have to wait a little longer for something to cheer, as an early bounce was wiped out about an hour after the open, as the sector an already lengthy losing streak. The Horizons Marijuana Life Sciences exchange-traded fund HMMJ, -6.09% plunged 6.1%, after erasing an earlier gain of as much as 3.4%, with 37 of 48 components contributing to the loss. The sector tracker has now tumbled 28% amid a seven-session losing streak, matching its longest-ever stretch of losses that ended June 9, 2017. The ETFMG Alternative Harvest ETF MJ, -4.79% slumped 4.8%, after being up 3.3% at the intraday high, with 28 of 35 components losing ground. The ETF has dropped 26% the past seven days. The sector has had a rough time since marijuana became fully legal for adult use in Canada on Oct. 17. Among the most active pot stocks, Aurora Cannabis Inc. ACB, -5.58% seesawed back into negative territory, falling 5.6%, after being up as much as 6.9% at the intraday high and down as much as 7.1% at the low. The stock had marked its NYSE debut on Tuesdaywith a 12% plunge. Read more MarketWatch’s profile on Aurora Cannabis. Shares of ICC Labs Inc. ICC, -4.05% , the company Aurora said last month it was buying for the U.S. dollar equivalent of about $220.4 million, dropped 4.6%. 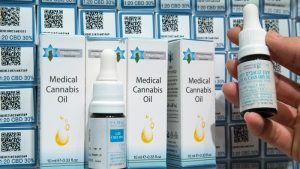 The Vancouver-based producer and distributor of medicinal cannabinoid extracts and recreational hemp in Uruguay and medicinal cannabis in Colombia said Wednesday that advisory firms Institutional Shareholder Services Inc. and Glass Lewis & Co. both recommended ICC shareholders for in favor of the acquisition by Aurora. Shares of Tilray Inc. TLRY, -9.52% tumbled 9.5%, reversing an early gain of as much as 5.8%, and have now plunged 34% over the past seven sessions. Among other active stocks, Canopy Growth Corp. CGC, -7.92% dropped 7.9%, Cronos Group Inc. CRON, -8.51% shed 8.5%, Aprhia Inc. APHQF, -7.20% lost 7.2%, Hexo Corp. HYYDF, -5.36% sank 5.4%, New Age Beverages Corp. NBEV, -12.79% slid 13% and Supreme Cannabis Co. SPRWF, -1.46% slipped 1.5%. Elsewhere, shares of GW Pharmaceuticals PLC GWPH, -4.91% slid 4.9%, Green Organic Dutchman Holdings Ltd. TGODF, -7.77%lost 7.8%, India Globalization Capital Inc. IGC, -16.13% plunged 16% and MedMen Enterprises Inc. MMNFF, -6.96% gave up 7.0%.